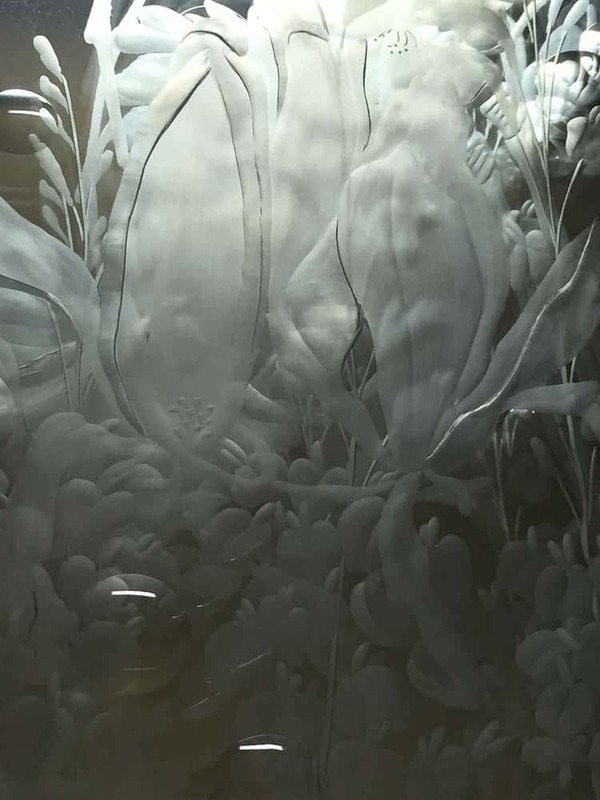 detail of Garden fracture/ Mirror in vapour 2016, engraved glass, mirror, slumped and mirrored glass, cast and mirrored Murano glass. 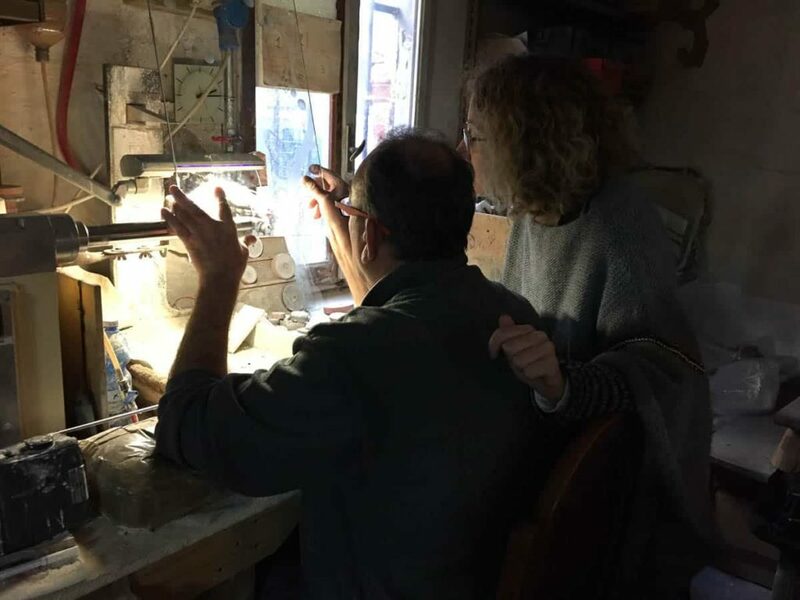 Maurizio Vidal and Francesca Giubilei (VeniceArtFactory) working on engravings of Rosslynd Piggott drawings at Ongaro e Fuga workshop, Murano, 2016. Maurizio Vidal engraving Rosslynd Piggott drawings Garden fracture/ Mirror in vapour, 2016. Layered sets in progress in the foreground. 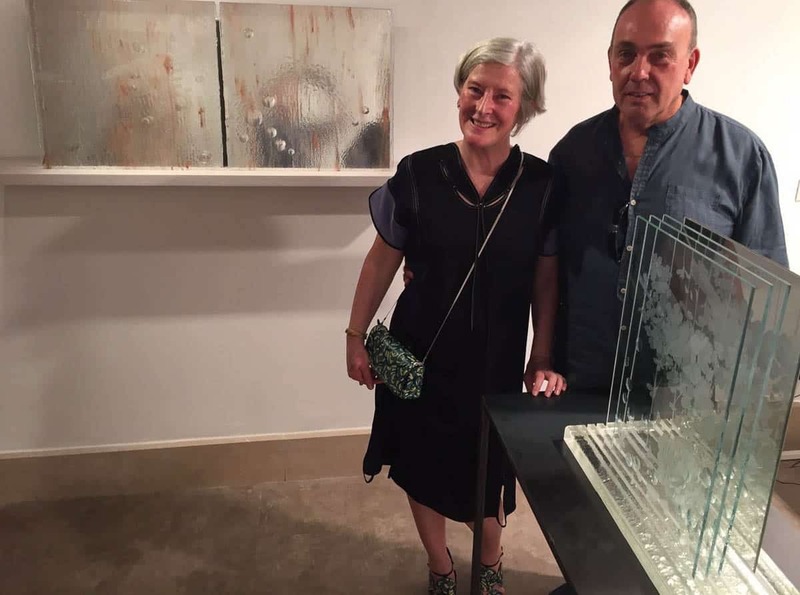 Ros Piggott and Maurizio Vidal at the exhibition Garden fracture/ Mirror in vapour: part 1 at VeniceArtFactory, Castello, Venice, September 2016. 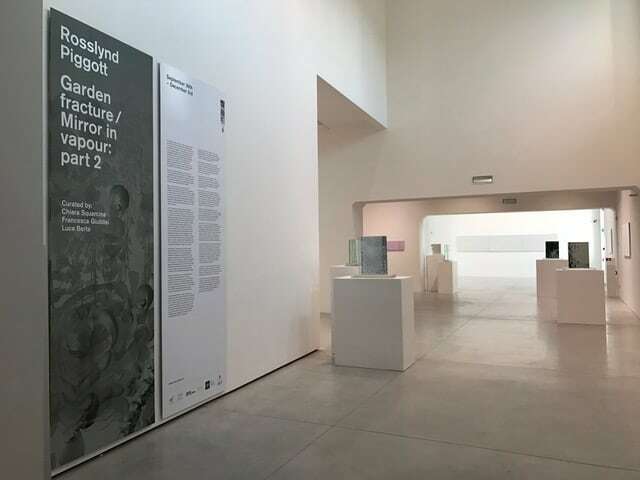 Rosslynd Piggott installation at Museo del Vetro, Venice. Glass has long held fascination and attraction as one of the materialities used in my practise. In 1990, 100 Glasses was the first work I made in collaboration with glass artisans in Australia (Michael Hook and Perry Fletcher, engraver).The work comprised 100 handblown glasses engraved with words starting with names of cities, far away, historically and romantically imbued, “Rome”, “Egypt”, “Thebes”, “Venice” and then moving to elements, “salt”, “ink”, nouns, a date in the past, a date in the future, “Marcel” (Proust or Duchamp), “Virginia” (Woolf) and followed by Latin names for favourite flowers and finally 14 unnamed glasses implying an openness, an unfinished space. The glasses were arranged in a single line mounted on a shelf and wall painted in a deep blue space to be read as a flow of consciousness, a linear spatial poem. Light passing through the glass vessels formed a doubled rippled image of form and text on the wall. I was just beginning to sense the material and metaphysical potential of glass in the context of my work, a process that is still unfolding. A substance that originates from sand, heated becoming fluid, shaped, cooling into a transparent solid. Glass as vessel may still further contain fluid, it can be filled, poured and emptied in cyclic flow echoing the fluidity of the material itself. A glass vessel also presents multiple spaces, a container, sealed and open. Our view encompasses the exterior, interior and the further exterior in the same moment. Transparency, at once fluid and solid, allows for a floating, unfixed perception of multiple and multiplying space. 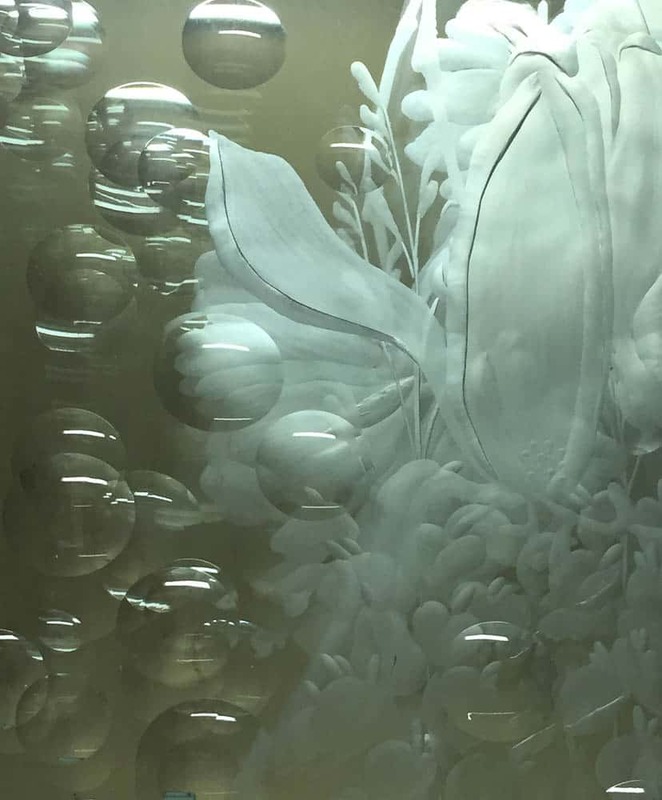 Glass has continued to be a material important to my practice for its paradoxical elusive qualities, containing and revealing, solidity and fluidity and for its ability to conjure a sense of multiple space. For a painter who works with many layers of fine transparent paint, glass has an immediate relationship to this physicality. I am not a glass artist. I come to the material of glass with a fascination as an artist, whose work has a central focus of painting and spills over into further materials and their possible evocative relationships through spatial placement as installation. As a material, glass has enabled me to contain and reveal, hold and potentially release. Collection of Air 1993- 94 was comprised of 65 glass test tubes sealing air collected every day on a journey from Melbourne through Europe and returning to Melbourne. A work in homage to Marcel Duchamp’s exquisitely resonant, elegantly economical Air of Paris, 1919, and further expanded upon the power of the apparently invisible and our potential to visualize and dream. A collected air travel diary, many samples collected near at significant art historical sites, Air near Rodin’s Gates of Hell, Air near Piero della Francesca’s Legend of the True Cross, Arezzo, Air near Edith Sitwell’s ring collection, V&A Museum, others more general Air of Paris or air collected in friend’s homes. No doubt the actual collection was sometimes amusing, as this strange young artist swooped the air with an empty glass test tube in her poetic rather than scientific efforts. The collection was corked and slipped into my pocket to be wax sealed at the end of the day, embossed with “R”, my initial and French in sound for “air”. A considered vitrine was later made for the work (I collaborated with David Poulton, both an architect and highly skilled woodworker. Our collaborations have continued since this work.). When I exhibited the work, I was amazed to witness an audience completely engaging with these tiny spaces of the apparently invisible, labelled with the specific details of site and date, as the only markers for their imagined projections or likely memories. The labelled information seemed to take them on an extended journey into the tiny and yet expansive space of the invisible. Perhaps I had performed a spell or some kind of seduction, as people gazed into the collected air to see an abundance of gathered memories. A scientist working for the CSIRO told me some time later that I had, in fact, collected data that could be quite accurately measured for information about the time and place. It is true that artists do not always know entirely what it is that we perform. Intuition can be a short circuit that overlaps with other fields of knowledge. Collections of air have sustained a fascination and I have continued to make several more in both Japan and Italy. In Japan at the Zen heart garden during Springtime at Tenryuji Temple, Arashiyama near Kyoto, titling the edition Air of Flower Clouds and Yamazakura, an air collection near the Cherry Blossom Tree numbered 548 on the moat of the Imperial Palace, Tokyo, as a homage to writer, Yukio Mishima. In Italy, I visited the famed Giardino di Ninfa, south of Rome during Spring in 2011 and again in 2012 with nine elaborate vessels (made with Berengo studio in 2012 and working with several artisans) depicting nine sites and floral form in the garden to capture air. The garden is a site of hyper unworldly Beauty, grown and later cultivated over a ruined medieval town with Roman origins. Its vision is barely believable. A site of deep thermal springs, the garden continues under crystal clear waters, we might expect to see swimming nymphs and unicorns. Each air collection has its own extended narratives and embedded devotions, particular to the site. The Ninfa collection of air and glass stands are still to be finally assembled. 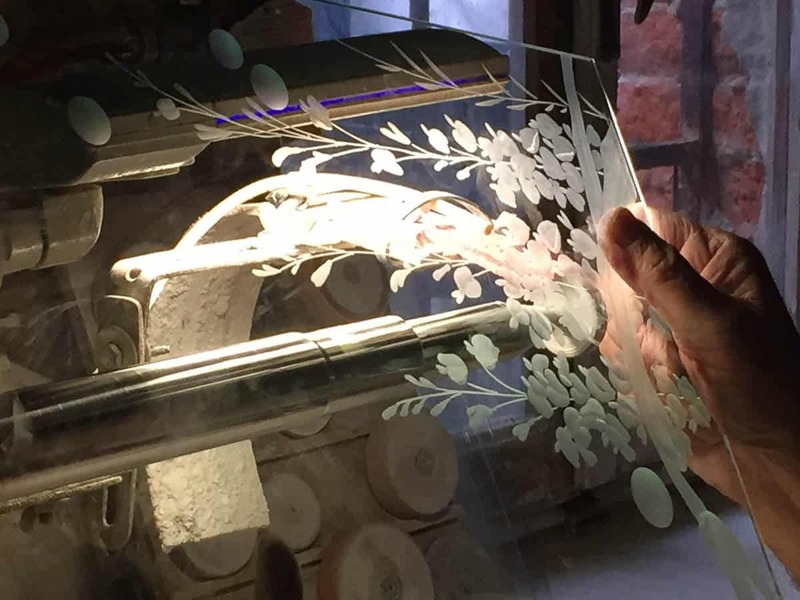 During this time, one of the artisans I met was Maurizio Vidal, engraver based at Ongaro e Fuga, Murano. Among the various artisans and techniques involved in making the vessels for the air of Giardino di Ninfa, Vidal came closest to understanding and realizing my concept. Despite our lack of a mutual language, Vidal understood my drawings of the floral species, not only their visual appearance, but more importantly, my feeling for the flowers and the garden. It is rare good fortune to meet and work with such a consummately skilled artisan and one who understands the feeling and spirit of the work so innately. 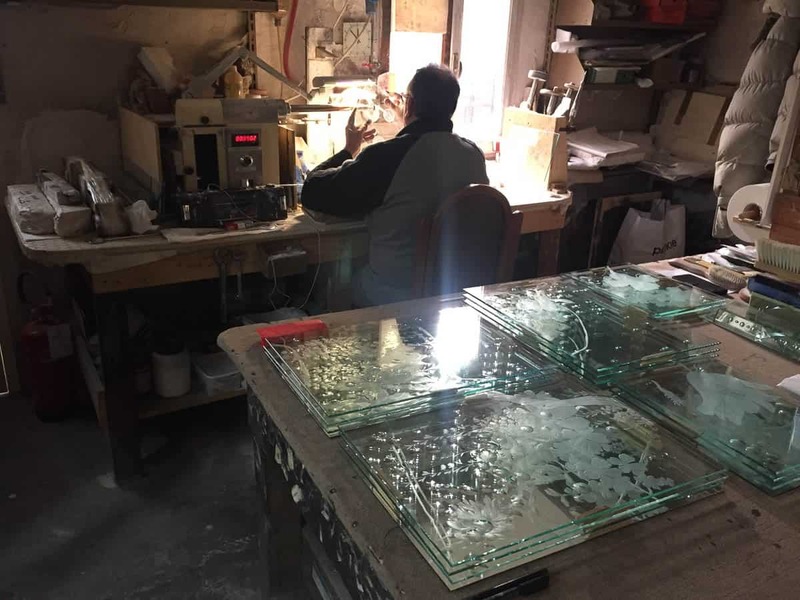 I have been further fortunate to return to Murano during winter over the past few years to continue to work on engraving drawings with Vidal, each time further refining and extending the ambition for the works. 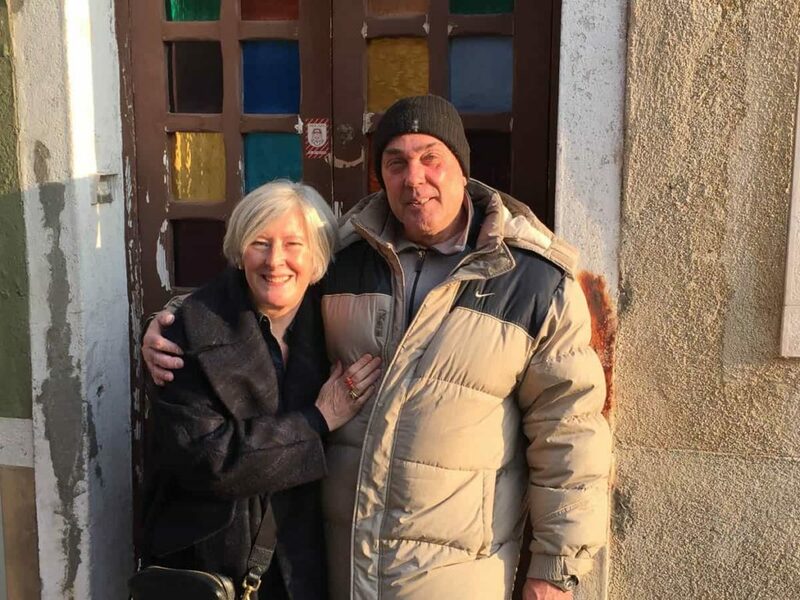 Through the careful, delicate and dedicated guidance of Francesca Giubilei and Luca Berta (founders and Directors, VeniceArtFactory) my intentions are communicated to Maurizio. “ The cherry blossom petal turns here… the peony folds outwards…the magnolia petal droops and is heavy… please make the pistels irregular, they must vibrate…” Photographs and videos are shown from floral field trips in Australia, Japan and Italy. Every consideration has become more acute and realized over my several visits. The layered structure for these transparencies Garden fracture/Mirror in vapour occurred out of a fortunate mistake that then continued on its own journey. This multiplied form of the engraved drawings approaches a deconstructed mirror. I have long been drawn to an unclear mirror, as an object and an idea, held in fascination with ancient mirrors, darkened by the oxygenation of time. I have made several slumped mirrors that retain their liquid fogginess, presenting a beguiling paradox holding the vision of a non-self. As we peer through refracted and bouncing surfaces, myriad bubbled lens, overlapped with broken wisteria, falling Cherry Blossom petals, laden peony, the multiplied vision of a garden in collapsed chaos is akin to an unpeeling of self. There is lost time and something found, further fracturing. As the garden distorts, expands, falls and freezes suspending itself in watery layers, so too does our gaze – we follow inwards in Beauty and fear, knowing this is for the moment. Now and maybe it ever was, forever. Mishima venerated old Japan and thus the belief of the Emperor as a living God. In 1970, Mishima infamously took his life in ritual suicide as a protest gesture for the fading of a traditional Japan. Yamazakura is a mountain cherry blossom, venerated by samurai for its ability to withstand tough conditions and produce exquisitely delicate blooms. This project was made with the assistance of A.R.T Tokyo, directed by Joni Waka, exhibited at Shinsei Bank along with footage on a huge outdoor screen mounted on Tadao Ando’s Omotesando Hills Building, Aoyama, Tokyo, 2006. Thanks to the initial facilitation of the British School at Rome in 2011 and to the great kindness of the Director of Giardino di Ninfa, Lauro Marchetti. I am indebted to his generosity and sensitivity towards this project. I have been fortunate to experience the good fortune of working with a number of collaborators, including David Poulton, Marcos Davidson and Shusaku Nakahara. Francesca Giubilei was the first person in Venice to see my work and to recommend it to Berengo studio. Francesca and now Luca have continued to be my steadfast supporters. I am deeply grateful to them.